If you are missing several teeth, you may need an implant-supported bridge. Two or more implants can support other missing teeth. 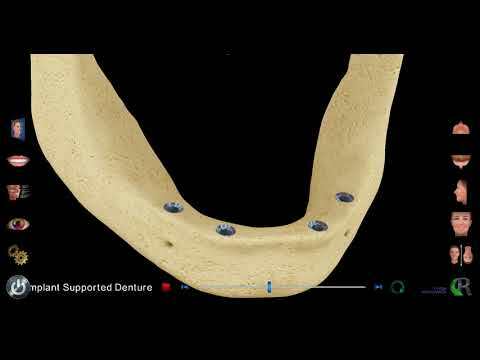 In addition, an implant-supported removable appliance, either a denture or a partial denture, can be made with enhanced stability if dental implant support is possible. A key to dental implant success is the quantity and quality of the bone where the implant is to be placed. The upper back jaw has traditionally been one of the most difficult areas to successfully place dental implants due to insufficient bone quantity and quality and the close proximity to the sinus. Sinus augmentation can help correct this problem by raising the sinus floor and developing bone for the placement of a dental implant. Deformities in the upper or lower jaw can leave you with inadequate bone in which to place dental implants. To correct the problem, the gum is lifted away from the ridge to expose the bony defect. The defect is then filled with bone or bone substitute to build up the ridge. Ridge modification has been shown to greatly improve appearance and increase your chances for successful implants. "In coming to Dr. Gandhi, I was really surprised that the time that he does take with the patient - he answered all my questions. I was really afraid of the surgery that I was going to be going through because my aunt had gone through it. and I knew the pain she was in. He didn't leave my chair side until I was very comfortable with what I was going to be going through. He guaranteed me I wouldn't have that much pain afterwards, and I didn't. "